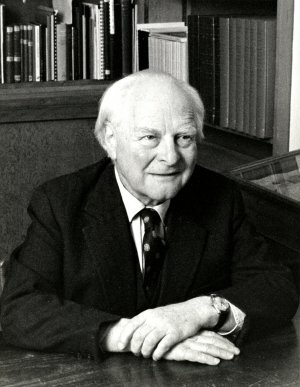 Willi Steiner succeeded Howard Drake as IALS Secretary and Librarian on 1st August 1968. With the growth in his workload as IALS expanded and prepared for the move to its new building, in 1971 it became necessary to divide the posts of Secretary and Librarian and convert each of them into a full-time post. He continued as full-time Librarian from 1971 to 1982. Willi was born in Vienna in December 1918 and died in May 2003. He read law at Vienna University while studying at the same time at the Consular Academy, an international college of international law and relations. He was awarded an Honours Diploma by the Academy in 1938 and later in the same year came to London as a refugee. He became a member of Gray's Inn and in 1942 he was called to the Bar, although he never practiced. He was awarded the University of London external LLB degree in 1945 and the external LLM degree in 1948. His LLM dissertation was entitled: The transfer of shares and debentures in private international law and is still consulted by scholars at IALS Library. During the latter part of the Second World War and for more than a decade thereafter he worked at the British Library of Political and Economic Science, first as a part-time library shelver and then later as the full-time Law Librarian. He naturally worked closely with the first permanent Assistant Librarian at IALS, Barbara Smith. They married in July 1950 in what Howard Drake "used to refer to as an outstanding example of co-operation between London law libraries".1 Luckily Willi knew Howard Drake well, the more so as he had been Assistant Editor of the Index to Foreign Legal Periodicals from its inception in 1959. Also in 1959 Willi moved to the University of Cambridge and was appointed to the post of Assistant Librarian at the Squire Law Library. His lasting achievement there was the creation of the Library's classification system which is still being used today. Willi Steiner was a gentle and modest man with a mischievous sense of fun who inspired great loyalty and fondness among his staff. He was also a continental lawyer and an expert linguist whose ideals of collaboration and internationalism imbued much of his work and life. Like his friend and colleague Howard Drake, he travelled widely, cultivated a wide range of international contacts and was a highly respected member of the profession in the UK and overseas. He was General Editor of the Index to Foreign Legal Periodicals from 1968 to 1984. This key transatlantic role also allowed him to continue to develop the close relationship between IALS Library and the American Association of Law Libraries. He also undertook a major tour of law libraries and law schools in 1972 to investigate new issues in law librarianship. Moreover, because of his wide experience and knowledge, major law libraries often consulted him on important projects. For example, he constructed the classification system for the European University Institute in Fiesole where he was appointed Visiting Professor between 1980 and 1982. He was a founder member of the British and Irish Association of Law Librarians (BIALL) and President of the Association from 1985 to 1988. He served on committees of the American Association of Law Libraries (AALL) and as Vice President of the International Association of law Libraries (IALL). Author of many distinguished articles and book chapters, including the chapter on Foreign Law in the Manual of Law Librarianship, edited by Elizabeth M. Moys; London, Andre Deutsch for BIALL, 1976. 1 Winterton, Jules. In celebration of Willi Steiner. Legal Information Management, vol.3, number 3/4, p.140-149. 2 Diamond, Aubrey L. Will Steiner and the Institute of Advanced Legal Studies. The Law Librarian, vol.15, 1984, p.46. 3 Steiner, William A. Future trends in international law librarianship. The Law Librarian, vol.26, no.2, June 1995, pp.316-320.